As well as lots of brand new facilities at Hemsby Beach Holiday Park, we have also added an exciting variety of fun Go Active activities for everyone to enjoy! Our great range of activities includes Archery, Body Zorbs and a Traversing Wall! There’s something for most ages and abilities to get stuck into! In this article, we’ll explain THE CROWS NEST*. What is ‘The Crows Nest’? 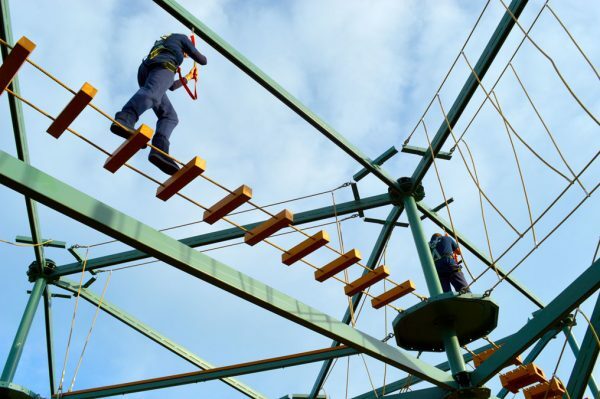 Our new for 2019 high ropes course, The Crows Nest, is the best way to our nerve family and friends and reach new heights! What can I expect from my Crows Nest Experience experience? Our trained instructors are on hand to help secure you into your harness so you can explore the course! *As with all Go Active activities, charges apply. You must be 1 metre tall, if you’re under 1.3 metres tall you must be accompanied by an adult.